BB Chronological 31: BB #15 – Masters of the Macabre! Despite being present way back at the birth of Big Bang Comics as one of the back-up stories in my Berzerker comic book for Caliber Press, Big Bang Comics #15 (published by Image Comics in November of 1997) gave Dr. Weird his first real chance to shine in the pages of Big Bang. 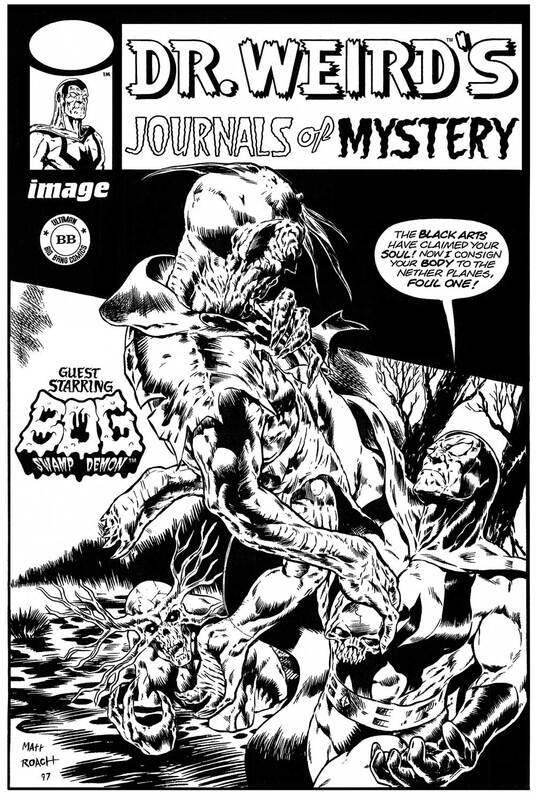 The front cover was by Stephen R. Bissette and heralded the main story in which “Doctor Weird meets Bog, Swamp Demon! 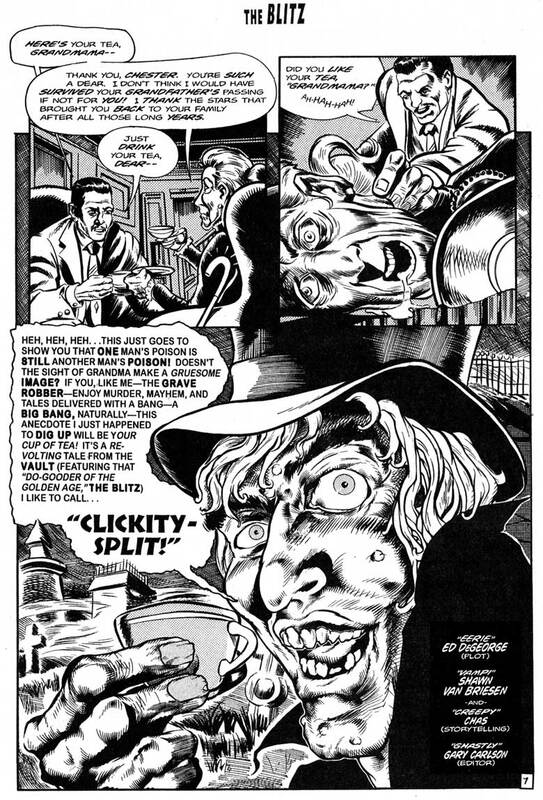 To be fair, the Master of the Macabre had appeared in a few solo stories over the course of the 19 or so issues of Big Bang which preceded this one, guest-starred in the Round Table of America stories and even headlined three issues of his own title at Caliber Press, but this was his biggest exposure in the main title so far. Long-time readers may recall that Dr. Weird actually predated Big Bang by about thirty years. He was created by Howard Keltner and appeared in the fanzine Star-Studded Comics from 1963 to 1972, plus two issues of his own book. I met Howard through his good friend Grass Green in the 1980s while working on my Megaton title. Dr. Weird was going to join that comic universe until we stopped publishing. He even appeared in the Megaton Explosion, a 16 page color Who’s Who featuring our characters in 1987. Howard later sold us the rights to the character when he became ill.
From the earliest days of Big Bang, it was decided that Dr. Weird’s Journals of Mystery would have been his Golden and early Silver Age comic book title, being a play on Atlas/Marvel’s Journey Into Mystery horror-fantasy anthology that later brought us Thor. 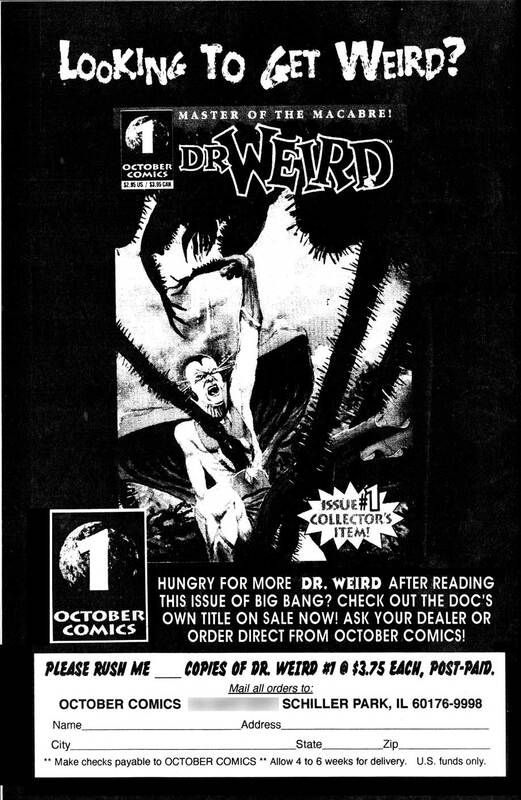 Big Bang Comics #15 featured three comic book stories, two of which starred Dr. Weird, and both referenced the Journals of Mystery sub-title. 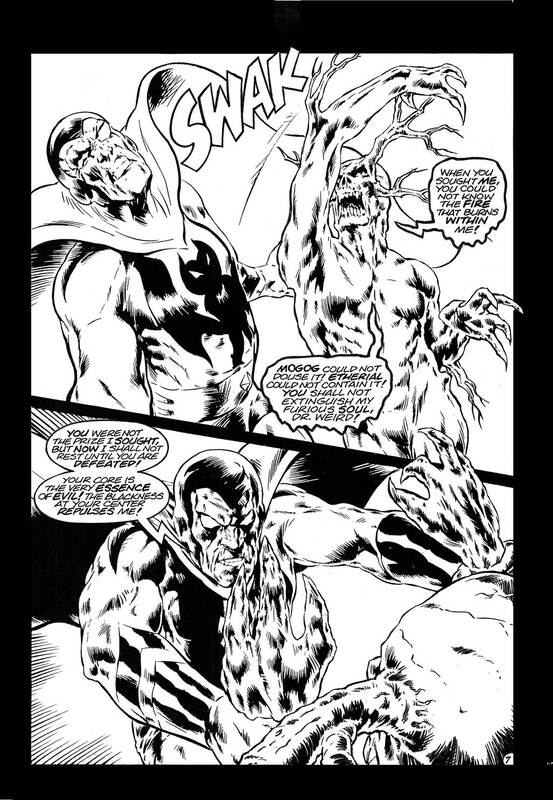 The first story was “Terror In The Swamp,” in which Dr. Weird’s pursuit of evil conjurer Lemuel Brisbane leads them both into Killbuck Swamp, the domain of a demon named Bauggroth, a.k.a. Bog, Swamp Monster. 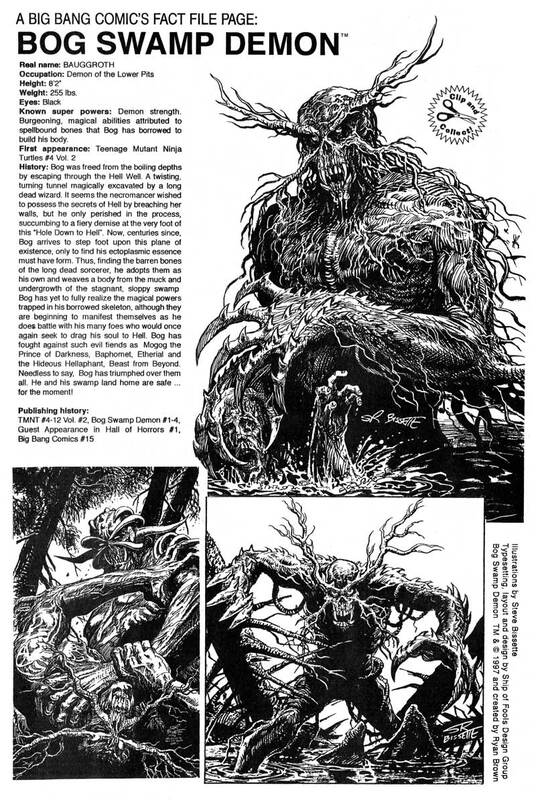 The art by Matt Roach and David Vance was nicely reminiscent of Bernie Wrightson, who had drawn Swamp Thing for DC (as did cover artist Stephen Bissette). The story was by Edward DeGeorge and Bog’s creator Ryan Brown. 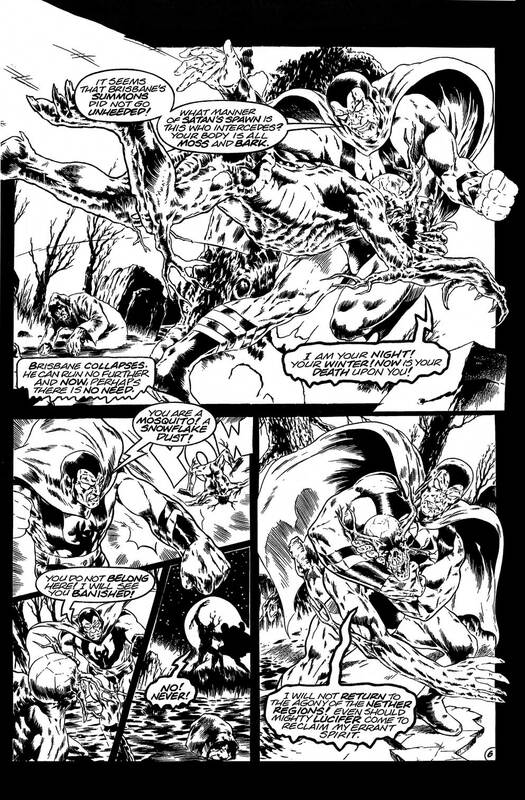 Bog had already appeared in Teenage Mutant Ninja Turtles and his own title before this appearance. I merely functioned as editor on the story, my main achievement being page 6 of the story, which began life as four separate pages – a double page spread, a normal page and a full page splash – which I editted down to a single page. 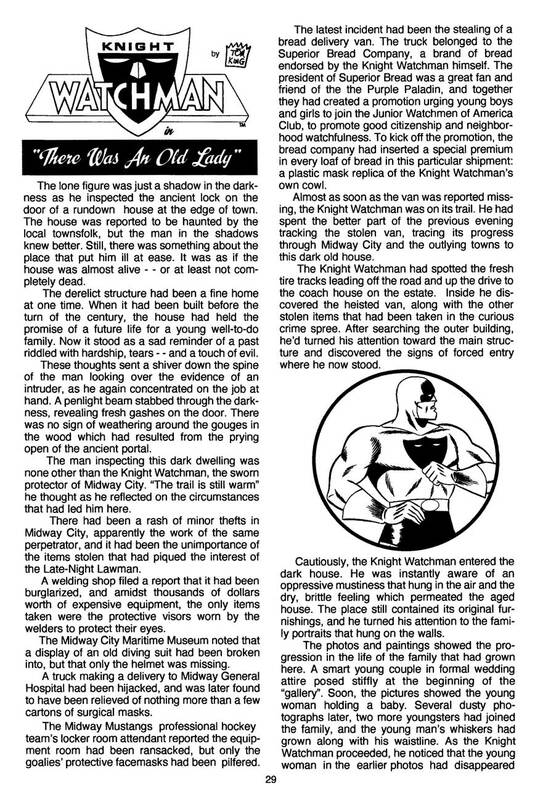 The second story in the issue is an EC horror homage starring the Golden Age Blitz, as told by a narrator named the Grave Robber. Ed DeGeorge plotted this tale, which was finished and drawn by Shawn Van Briesen and his studio partner Chas. The Blitz is on the trail of a Nazi spy that is murdering elderly Americans and stealing their savings when things take a supernatural turn in “Clickity-Split.” It’s a little creepy, a lot of fun and recaps the Blitz’s origin as a prisoner of the Nazis in World War 2. 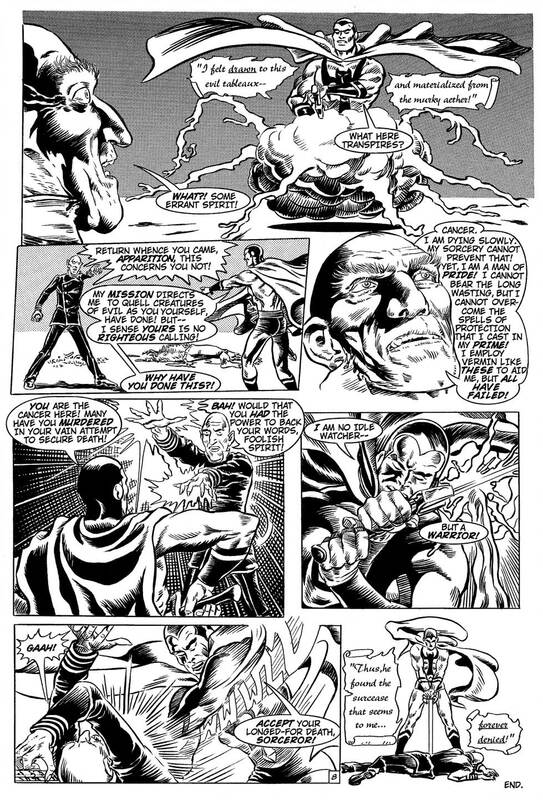 Dr. Weird returns in “The Sorcerer’s Death Wish!” to witness a confrontation between a sorcerer, a vampire and a werewolf. 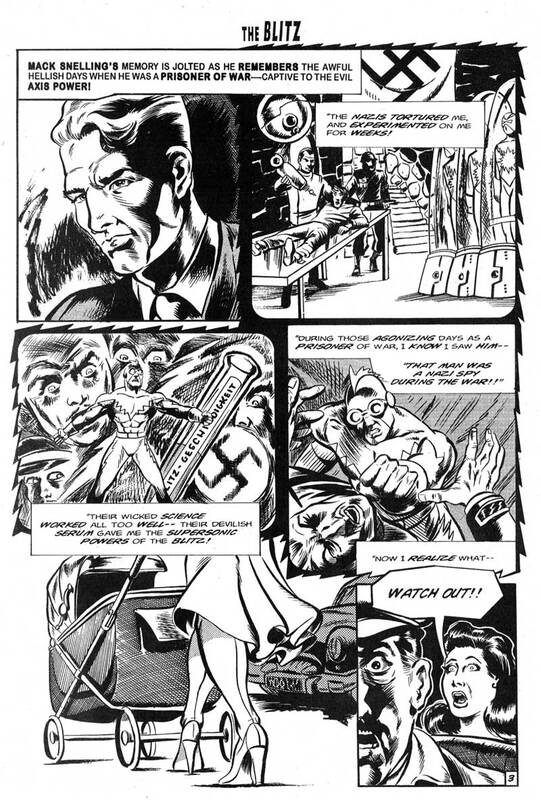 Written and drawn by Ed Quinby, the good Doctor shows up at the end to tie up the story. 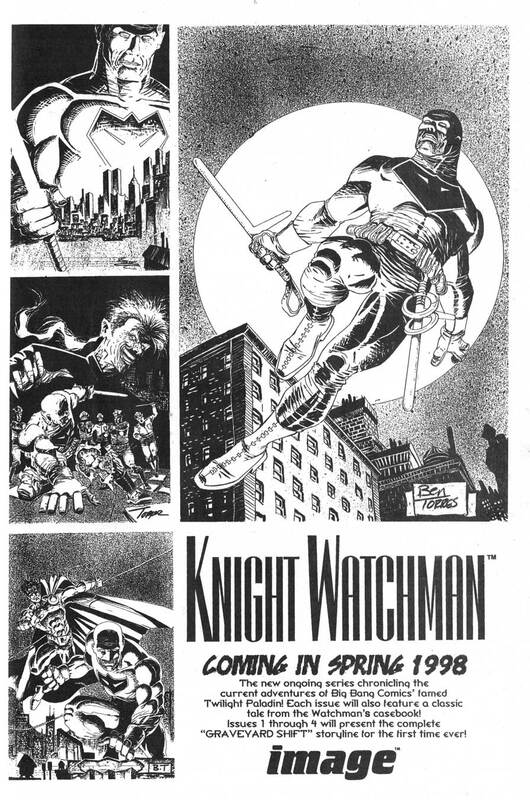 All this, plus an ad for the new Dr. Weird volume 2 #1 from Ed DeGeorge’s October Comics and an ad for the four issue mini series Knight Watchman: Graveyard Shift, soon to be published by Image Comics. And that was it for this issue. See you next time for issue 16 of Big Bang Comics featuring Thunder Girl, Shadow Lady, the Absolute, Johnny Ruckus and the Monster Patrol and lots, lots more fun. Big Bang Comics and all related characters are © and TM Gary S. Carlson and Chris Ecker. Dr. Weird and all related characters are © and TM Gary S. Carlson and Edward DeGeorge. 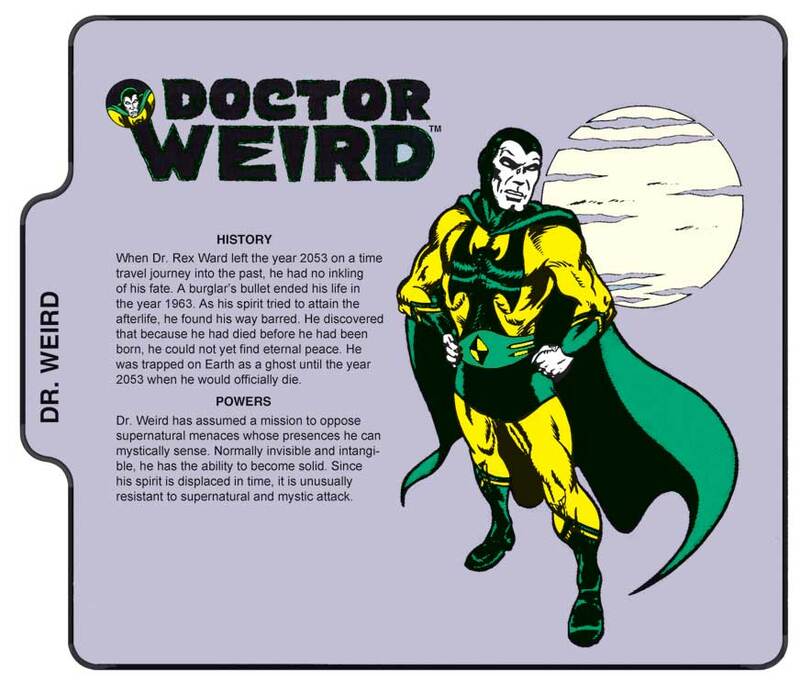 Dr. Weird created by Howard Keltner. Bog is © and TM Ryan Brown.